Gerry O'Halloran rips into the Alliance Party over its shameful abandonment of vulnerable people. 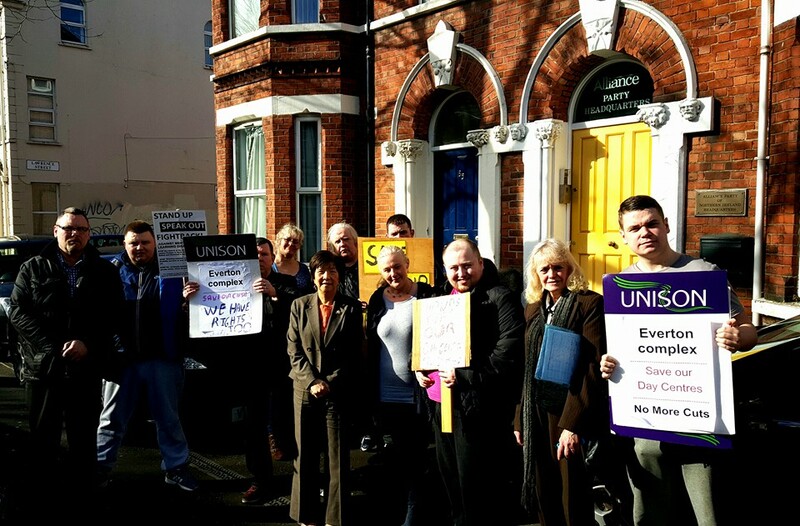 Gerry O'Halloran is part of a group of carers campaigning against closures of mental health and learning disability day centres in Belfast. This is Neil Kelly. Neil Kelly is the Alliance party councillor for Antrim town. Neil is also chairman of the Alliance party. Neil is a nice guy. Neil doesn't want the post office in Antrim town to close. Neil also works for the Belfast Health and Social care board, and he is their main man to wield the axe at cutting services for the most vulnerable. 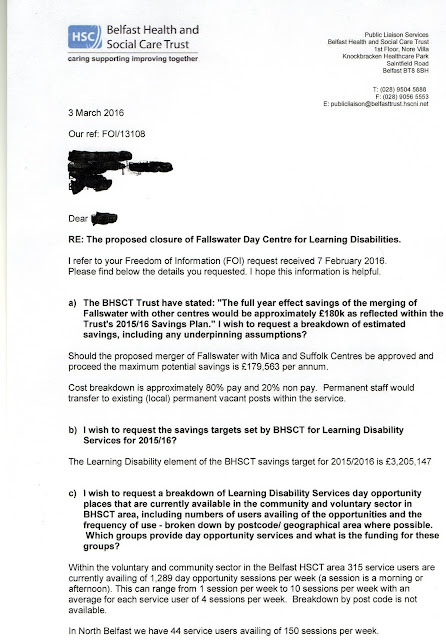 At present the board are making 'efficiencies', and in West Belfast this means the 'merger' of services for those with a learning disability. (LD) Neil came to meet families and carers in Suffolk day centre in September last year. There Neil blocked the press from entering and attending the meeting, and then he stood up and told us why this proposed merger of learning disability services was to take place. The merger according to Neil is not a closure, it was a change in policy, nothing to do with money he reassured us. No one believed him. At another meeting with families and carers, Tim Attwood a West Belfast councillor told Neil, that he had information from the Ttrust that the closure of Fallswater day centre would make a saving to the trust of £180,000 p.a. Neil said he knew nothing about that, and that's not all. The target of savings by the trust in Learning Disability services is over £3million for 2015/16 alone. That's a lot of money to find and take of vulnerable people. We found out about this not because anyone was upfront with us but one of our number put in a FOI request. 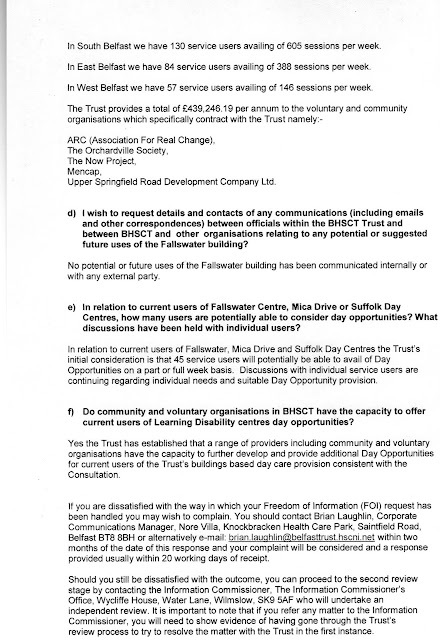 Here is a scan of the FOI request, click to enlarge. At the meeting in Suffolk day centre Neil put his reputation on the line. Neil said he was in LD for 33 years, trust him, this is what he would do. This 'merger' was a good thing. Again he was challenged there. He was asked why do you need to cut buildings to implement policy change resulting from Bamford? Why not keep the buildings and implement your policy change and then if you don't need the buildings close them? 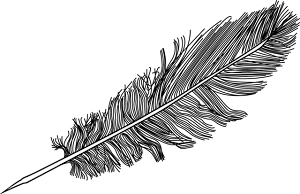 No,- this merger was the way forward, according to Neil. So what are you going to do with the building? 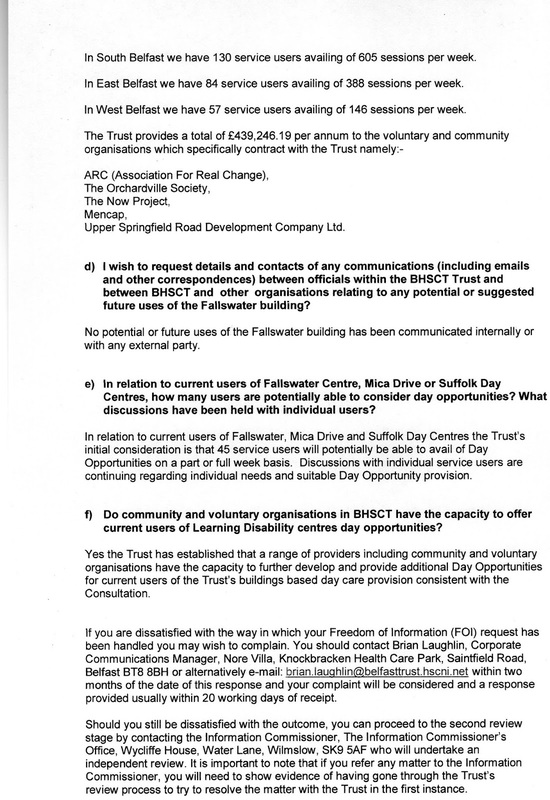 The Fallswater building was given to the trust by a handicapped association, why not return it to learning disability. To be honest, said Neil I've no idea what the Trust intends to do with the building. I believe him ... this is Lawther buildings in Conway Street in West Belfast ... obviously owned by the Trust ... lying empty while the area around it has been redeveloped.. The Trust is quite prepared to leave the Fallswater building like this one, abandoned and forgotten. Except there are quite a few with their Beattie eyes on it but who won't get it, as we are quite prepared to take it over. 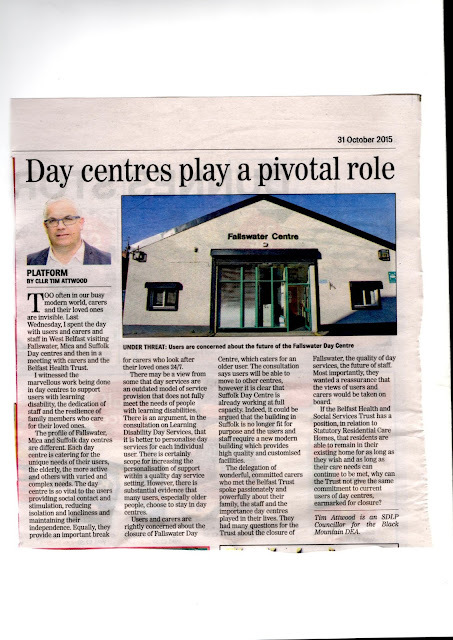 Our day centres play a piotal role..
Naomi Long used to represent east Belfast but now she doesn't represent anybody. However Naomi is looking to get elected again. So we contacted her to see if we could get Alliance support for our campaign. She was first contacted on Jan 28th but last November Alliance were contacted and their response wasn't favourable. So we thought we'd give it another go in January. Naomi was to get Duncan Morrow to give us a ring, but didn't. So after a further attempt to get Alliance support, Naomi finally got hold of Duncan and after some contact he told us that Alliance would be present at our Stormont protest. Here is the video. Please watch it if you can as it has invaluable information about the campaign to save mental health and learning disability services. 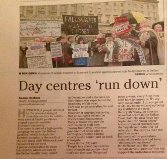 I suspect that this is what Jim Allister refers to when he says that there is dysfunction at the heart of government here.. When there is a party that cannot support a campaign for the most vulnerable without equivocation, you have to ask yourself - why is that party in government? What is its purpose? Alliance holds the justice ministry and is responsible for some of the worst conditions in our jails and cuts to legal aid. Is this how Alliance wants to step forward? By tramping on prisoners and ignoring the vulnerable? Alliance is stepping forward and what we are seeing isn't pretty.